Virtual Reality (VR) is one of the most cutting edge technologies to take the event industry by storm. It delivers an immersive experience that allows users to explore, learn, and participate in engaging simulated environments. VR is deployed using a variety of platforms including the Oculus Rift, HTC Vive, and many mobile platforms. Check out a more detailed look at the technology behind different types of VR here on the TTC Productions website. Imagine taking your guests on a journey anywhere in this world, or out of this world, without the added cost of a plane ticket! 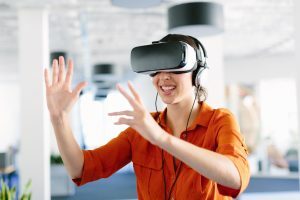 VR allows us to design limitless customized environments and we can even add the interactivity of allowing your audience to make choices about what they want to see, hear, and learn next while they’re inside the experience. 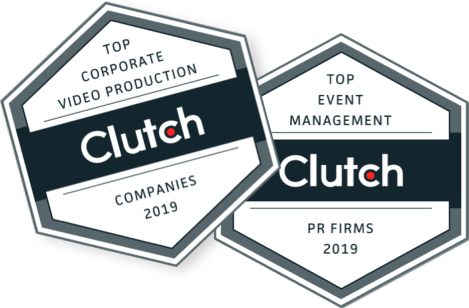 TalkingTree Creative works with top notch professionals to ensure that every aspect of an event is engaging and leaves a lasting impression on attendees. 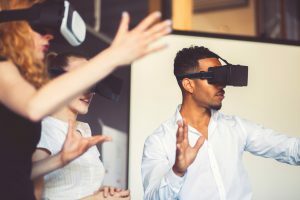 We believe that guests are far more likely to retain information if it’s presented to them in an exciting and entertaining way, and VR has proven to be a great solution for many companies. Read more about how we used VR to launch the Hughes Satellite team into outer space! TalkingTree Creative uses omnidirectional cameras to shoot 360 videos, resulting in an immersive viewer experience where the user decides the direction they choose to view the video! You can look left, right, up, down… and even directly behind you! 360 video provides a more lifelike experience, allowing the viewer to be a part of the scene as if they were standing right there in the middle of it all. You do not need VR headsets to experience 360 or interactive videos. Both YouTube and Facebook support 360 video. TalkingTree can deploy an interactive video that allows for user input on your website, or we can host it on ours!